1. Kinesiology tape provides support without restricting range of motion – a crucial factor for athletes who need to continue training and/or competing as they recover from injuries. 2. It begins to relieve pain and swelling almost as soon as it’s applied. 3. Once applied, kinesiology tape can stay on for 3-5 days, providing therapeutic benefits 24/7 for the entire time it’s worn. 4. The cotton fabric combined with the wave pattern of the acrylic adhesive allows both air and moisture to flow through the tape. This allows it to stay on through intense exercise, showering and even swimming without coming off or irritating the skin. 5. 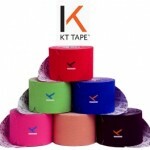 It’s inexpensive, costing approximately $14 for a 16 foot roll or $8 – $11 for a precut kinesiology tape application. 6. It’s small and lightweight making it convenient to carry in a sports bag or trainer’s kit. 7. While traditional sports tape is restrictive and can lead to overuse injuries in muscles recruited to compensate for the restricted area, kinesiology tape allows all muscles to function within a safe range of motion. 8. Kinesiology tape can be used effectively on virtually any type of injury on any part of the body. Look for my next posting on the conditions that kinesiology tape can be used for.